We believe that every single raw ingredient in a LAMBERTS® product is as important as the finished product itself. So we are meticulous in the tests we carry out to ensure that every product that is manufactured is subjected to a series of rigorous tests to guarantee that they meet the specifications given on the label. This commitment has enabled us to produce products of a quality that others can only aspire to. As part of this quality, there is the fact that all our products are Aspartame Free. This quality is what has helped us products like Vitamin B50 Complex or Colladeen Derma Plus are recognized as “winning formula” and “one of the best products of the year 2012 for its excellent results in clinical studies,” respectively. No wonder doctors, practitioners and consumers all over Europe recommend our brand to their patients and friends. Regardless of whatever kind, vitamins, digestive aids, multiple formulas, fatty acids, etc, premium quality products need to provide the correct potency since dosage is the key to success when using nutrition and herbs in clinical practice. You can have selected the right nutrients but get the levels wrong and you won’t get the results you hoped. And whilst you’d be right in thinking that getting the dosage right is a fundamental requirement in practice, it is surprisingly difficult to achieve this by using many of the supplements on the market. At LAMBERTS®, however, we start with dosage. 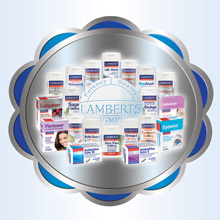 LAMBERTS® philosophy of healthcare is all about ‘sound’ science – we only develop products that are at the right potency and supported by a valid scientific rationale. Indeed it is the potency of our products that truly sets us apart from other brands and enables practitioners to be able to put their trust in our products. Great products need to be perfectly labeled too and LAMBERTS® has pioneered the accurate labeling of dietary supplements. LAMBERTS® takes considerable care to use the correct terms for all the ingredients in our products and we do not hesitate to declare everything that is used. What we say on the label is an honest representation of what is in the product. To be sure that our tablets or capsules contain the active ingredients specified we know that certain inactive ingredients need to be used. It is very difficult, if not impossible, to produce food supplements without using some inactive ingredients and products whose labels do not show any are in our opinion, either inaccurately made or inaccurately labeled.